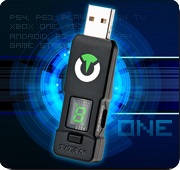 Titan One 2.38 and Gtuner PRO 3.42 are here! New updates for Titan One firmware and Gtuner Pro software are now available! We wish thank you our users for the great support we have been receiving from you. With Gtuner PRO 3.42 you can now utilize a nice and intuitive graphics interface to allow user configuration of your scripts, similar to the existing Gamepacks configuration interface. The support for Generic HID Controllers received many improvements, including proper HID input designators for programming and debugging with Gtuner’s Device Monitor. Today we’re excited to announce updates to Titan One firmware and Gtuner Pro software that extend the capabilities and potential of the Titan One device and reinforce our commitment of continuous support our products. In particular, the updates brings full support for the Xbox One Elite controller, including total access to the paddles via scripting; the compatibility with the Xbox One App for streaming play on Windows 10; and the ability of use the Arduino Leonardo with Mojo, which greatly increases the range of products for disabled gamers that can be used with the Titan One on all compatible consoles (PlayStation 4, Xbox One, etc).